Jenn and Matt Outdoor Wedding in Rancho Santa Fe. This wedding was at a beautiful private estate in Rancho Santa Fe. The house looked like it was directly from the Rhone region of France, the views were exquisite, overlooking a small vineyard that was a part of the property. 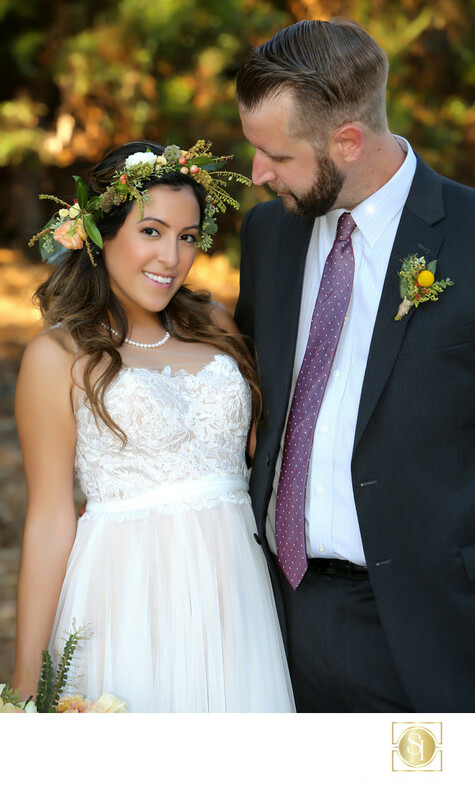 The bride, Jenn, wanted an outdoor, natural, "forest-y" wedding and she certainly got that. Rancho Santa Fe, if you're not familiar with the area, is known for its extensive groves of Eucalyptus trees, the fragrance wafts over everything around. Her flower crown gave her the appearance of a forest sprite and perfectly suited her personality. The overall vibe was a close mix of casual and formal, French vineyard chateau and autumn Southern California, a mixture that works very well together. The image of the two of them was taken just around sunset with a Canon 5D mkIII and 70-200 f2.8L IS, 400 ISO. One of the beauties of the 5D3 is how clean ISOs that used to be considered high are and that 400 ISO is like 100 used to be, noise free. Ah, the joys of modern technology.